Snakes vary widely in their size, physical appearance and hunting habits. Despite the many differences that characterize different species, all snakes share a basic common physiology, including nostrils. These they use mostly for respiration, though nostrils have some smelling ability as well. Snakes range in size from only a few inches to many feet long. All snakes are limbless predators that feed on live prey or eggs. Although people are often afraid of snakes owing to their venomous capabilities, most snakes do not use poison to hunt down their prey, but rather strangle it and swallow it whole. Because snakes ingest large meals infrequently, they often swallow things even bigger than themselves, and therefore need to unhinge their lower jaws to get it down. Snakes have a highly developed sense of smell that they use for hunting. However, they don’t rely mainly their noses to smell as many other animals do. Rather, they gather particles from the air around them by flicking out their tongues, to which the particles then stick. When snakes withdraw their tongues back inside their mouths, they transfer them to their olfactory center, the Jacobson’s organ, for analysis. This is not to say that snakes don’t use their noses at all, however; it is likely that their nostrils do have primitive scent capability. Snakes primarily use their nostrils to breathe. Because they generally open their mouths to smell, to eat and to make threat displays, they do not breathe through their mouths. Air that is inhaled through a snake’s nostrils then goes down his windpipe and into his lung. Because snakes are so long and narrow, they only have room for one well-developed lung rather than a double set like many vertebrates. Because they exist primarily at ground level, snakes cannot see long distances and do not have excellent eyesight anyway. Only some of them can see in color. While a common misconception is that snakes lack ears, they actually have inner ears that can pick up vibrations, and also sense sound vibrations through a bone in their jaw. Snakes have a much stronger sense of touch, since they spend so much time in contact with the ground, and a strong sense of taste as well, related to their smelling abilities. Live Science: Can Snakes Smell Anything? 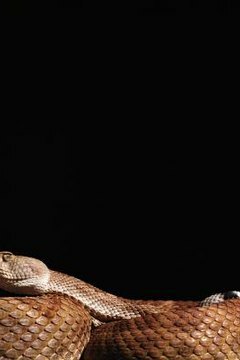 How Do Snakes Sleep With Their Eyes Open?